A very high quality Antique Victorian "Dickens" Writing Desk in mahogany. Highly original and with many unique features. 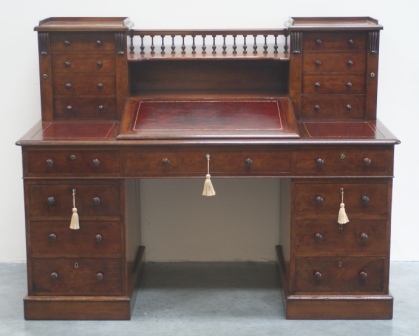 Polished mahogany with satinwood interior to the main slope this desk has a large number of drawers and storage areas making it a supremely practical desk. Of three piece construction for ease of transportation (two pedestals and the top) this fine desk has twin turned wooded handles to all the drawers and dark red leather inserts to the moulded top . The superstructure has "Wellington chest" type enclosures to the cabinets and a balustrade of turned wooden supports. The rear is polished mahogany and each pedestal has a substantial mahogany plinth. An excellent desk that is very useful in today's world. We have used this type of desk with a laptop for some time with excellent results - the slope is just the right angle and the side leather writing surface makes a fine mouse pad! Fitted satinwood interior beneath the main writing slope. Drawers - various sizes - pedestal drawers graduated.